We sell shredded paper by the bale. 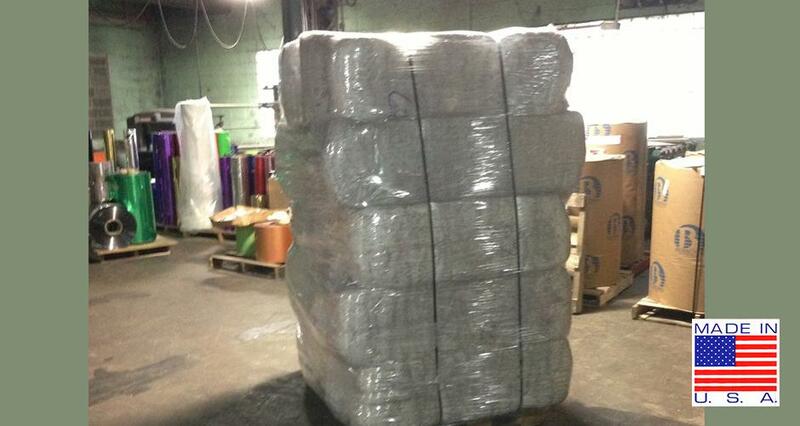 Shown here at our factory are five bales, each one weighing 100 pounds. We supply Passenger Cruise Ships The Olympics, Parades, Concerts, TV Shows, and more. Give us a call to discuss how we may best support your needs. Shore Manufacturing Co. is the largest supplier of confetti in the U.S. Even though our roots go back more than a century, Shore MFG is a world leader in innovation. A modern version of our traditional confetti is Green Magic TM, an environmentally-safe confetti that dissolves in water ! We offer a range of other products, including Christening Bottles for ships, snow for the Nutcracker ballet, a superior tinsel for Christmas trees, and mylar for a host of uses. The menu at left will lead you to all these exciting possibilities. First on the menu are the products, followed by some of the most popular applications they are used for. You will find links within each page to take you to other relevant pages. 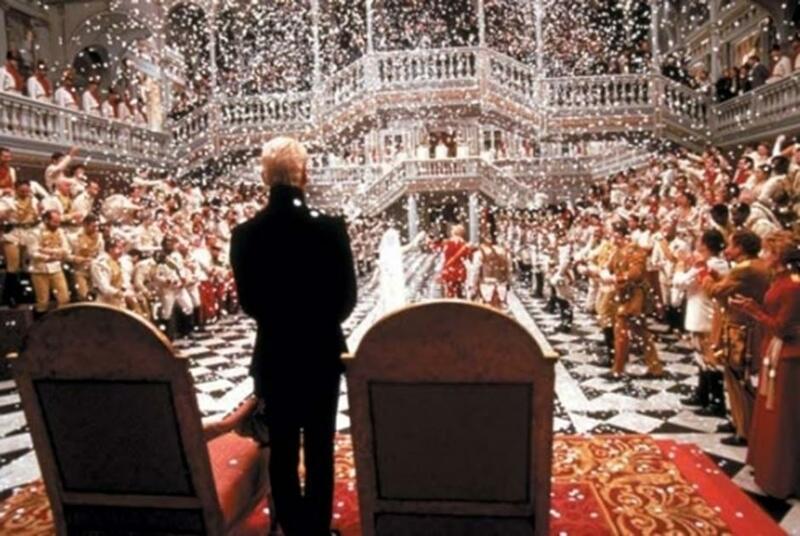 For example, Nutcracker Ballet will take you Snow, one of our many types of confetti. Prices are not included on this website. To inquire about purchasing any of our products, all of which are proudly Made in America, please click on the "About Us' section of the menu and either send us a message or give us a phone call. We are located in New Jersey. Many cruise ships use our confetti for christening ceremonies, sail-aways, or parties on deck. 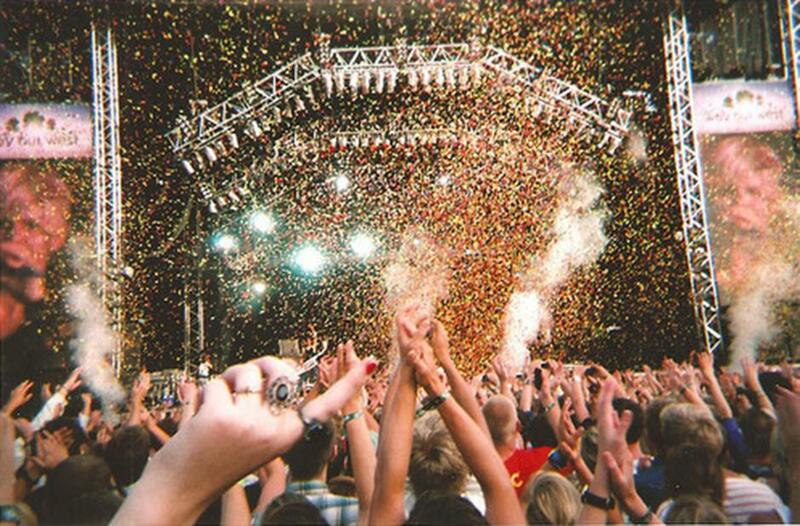 Many movies and television shows use confetti. Check out our selection to find the ones that best fit your needs. TINSEL TOSS is the modern answer to Christmas tree tinsel. Ever since the FDA banned lead tinsel in 1972, the availability of this Christmas decorating favorite has been limited to a cheap product that doesn’t work well. Instead of putting thin strands on the tree one by one, my product works faster and achieves brilliant results. In just five minutes, you can bring a tree to sparkling life just by throwing Tinsel Toss at the tree. Its broad strands cling to the branches of real or artificial trees- it saves decorating time and looks great! With 100 million Christmas trees annually in the United States alone, the potential market is enormous. 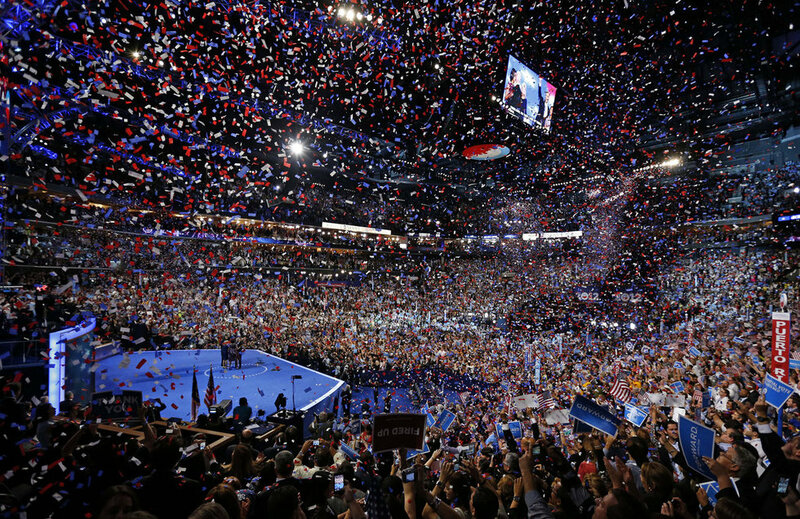 Every political party loves confetti to celebrate a nomination. ROCK IT with confetti !! 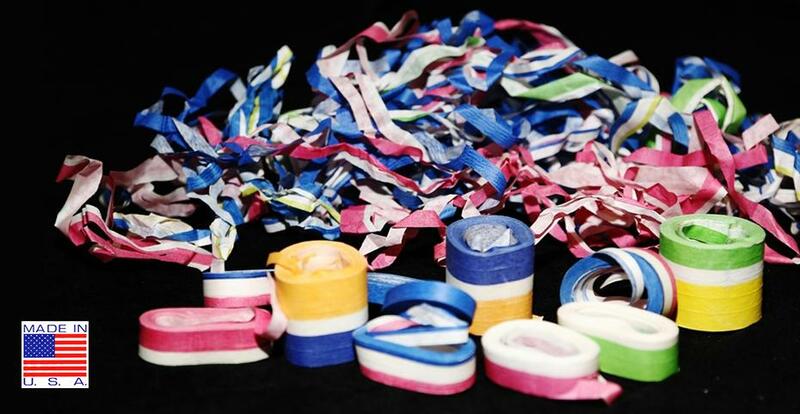 We have a wide variety of confetti options that will make the music seem even better. 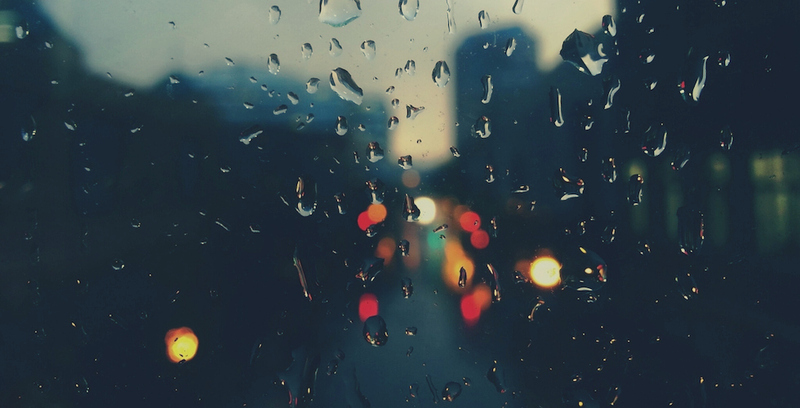 *Just wash away with water. The Green Magic confetti is especially popular on cruise ships. The photo of the sports stadium shows how easy it is to get rid of Green Magic confetti - just apply water from a pressure cleaner and it dissolves! No more messy clean-up operations that cost time and money. Photo by Carline Jean, staff photographer of the Ft. Lauderdale Sun Sentinel. Laboratory report: The National Oceanic and Atmospheric Administration directed Shore Manufacturing to send Green MagicTM to an independent laboratory for product testing. It proves that the Magic Confetti does not impact the environment relating to fresh water, salt water, fish or animals. The Laboratory study was completed on August 11, 2007, and is on file with Shore Manufacturing. A copy of the 19-page study is available by contacting us. You can't celebrate New Year's Eve without our confetti!! Ringing in the New Year without our confetti is unthinkable! 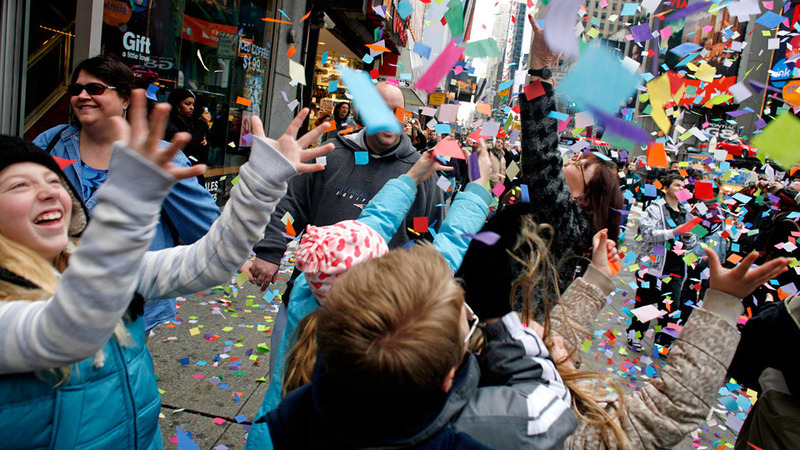 Whether you are in Times Square in New York, or any other place, confetti is a must-have product. In addition to these multi-colored circular confetti, check out our selection of Serpentines. They may be made in any color. Fifty to a box, 10 boxes to a case. The ever-popular Nutcracker ballet, which is performed in many cities across the world in December, uses bags of our "snow" confetti to create a Winter mood. No place loves our confetti more than Las Vegas! Our confetti is used at several nightclubs in Las Vegas. Mardi Gras without confetti? Never! 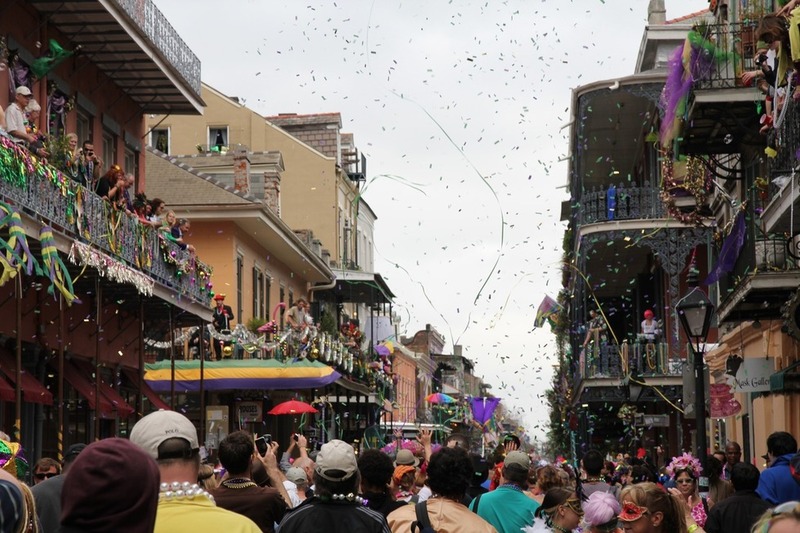 Confetti sets the mood in the French Quarter of New Orleans during Mardi Gras. Our festive confetti, great for any outdoor celebration, comes in many colors and shapes. Our wide range of colorful confetti, in many different shapes, is essential for the celebration of any outdoor event. Shredded mylar is great for any party! Think of the decorative possibilities for birthdays or Halloween! First photo: All the colors of shredded mylar are shown in this photo. It is available in 5, 10 or 25-pound bags, or a 100-pound bale. Our metallic sheets come in many colors, including the ones shown here. They are sold 50 to a bundle, or 12 bundles to a case. The first six photos show our 18 x 30 inch size sheets. Mylar sheets are also available in 9x9 inch size. There are 200 in a pack, with 12 packs to a carton. All the colors of mylar are available in this size too, which is shown in the seventh photo. In the first photo, the colors are from left to right: Burgundy, pink, cranberry, fuschia, azalea and red. Second photo: Turquoise, blue, blue-turquoise, navy blue, teal. Third photo: Burgundy, pink, cranberry, fushcia, azalea, red. Fourth photo: Silver, gold, black, opal. Fifth photo: Green, neon, orange neon, yellow neon. Sixth photo: Pologreen lime, green, brown orange, copper, bronze, purple. Seventh photo: A purple sheet in the smaller 9x9 inch size. Rectangular confetti gets shot from tubes! Six different confetti pre-loads. Each one is loaded with rectangular confetti- gold and silver ones are shown here on either side. There are 25 pre-loads in a case. This confetti is available in flame-retardant or non-flame-retardant material. The pre-loads are designed to be put into tubes with chargers that shoot them off. The chargers are shown here. Our classic product, Ship to Shores, makes a great gift idea. Our random cut confetti is sold by the pound. 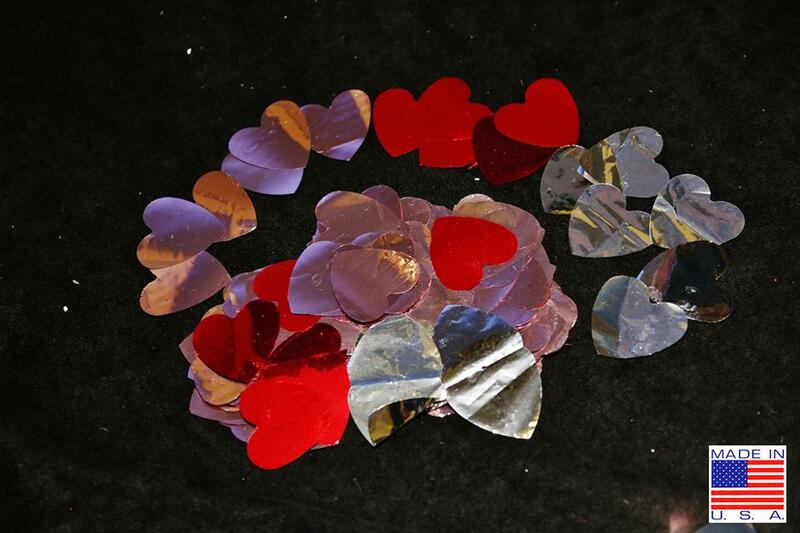 Heart-shaped confetti: great for Valentine's Day or a Wedding !!! Our mylar rolls are 48 inches wide. They come in lengths of 100 feet, or longer. 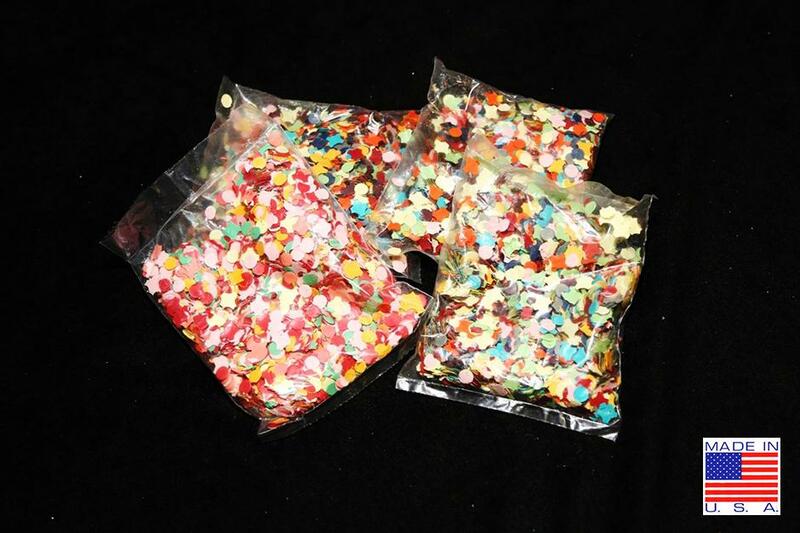 Multi-color confetti is available in bags. The photo shows our 1-ounce size pouch. There are 50 of these in a bag, with 10 bags to a case (a total of 500 of the 1-ounce size). The multi-color confetti is also available in 2-ounce or 10-ounce sizes. An example of our square-shaped confetti. Shown here is gold, but it is available in any color. Our christening bottles are essential for any maiden ship launch. Company President William Loughran is shown here christening a new ship. Our bottles have been used for decades to launch ships and submarines- even the country's most famous First Lady, Jackie Kennedy, used our christening bottle in 1962. Read more about this in our Company History. Shower the newlyweds with confetti! Most appropriate is our heart-shaped confetti. Our biodegradeable Green Magic confetti is one of many options you have for the Wedding festivities. Serpentines, most popularly used at New Years' Eve, can be made in any color. They are sold 50 to a box, with 10 boxes in a case (one color per case). 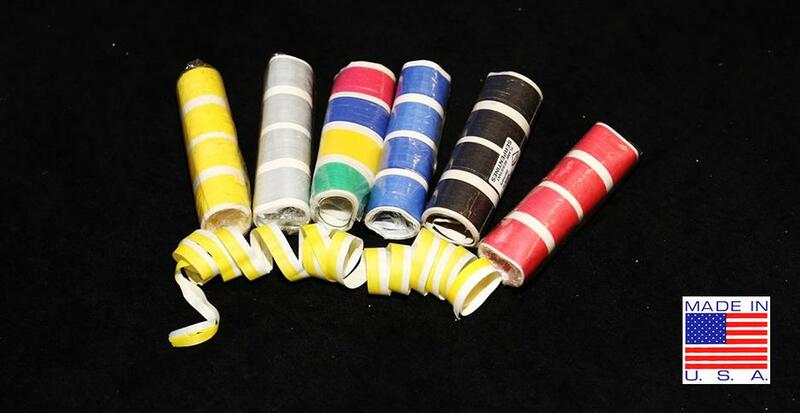 Cannon streamers are made in either mylar (metallic) or tissue. They are sold 25 to a box in a range of colors (one color per box). The third picture shows a cannon streamer with the tube it fits into. It all started with Brooklyn Lace around 1850. They made ship-to-shores, confetti and lace. That company was bought by Shore Manufacturing, which started in the 1950s. 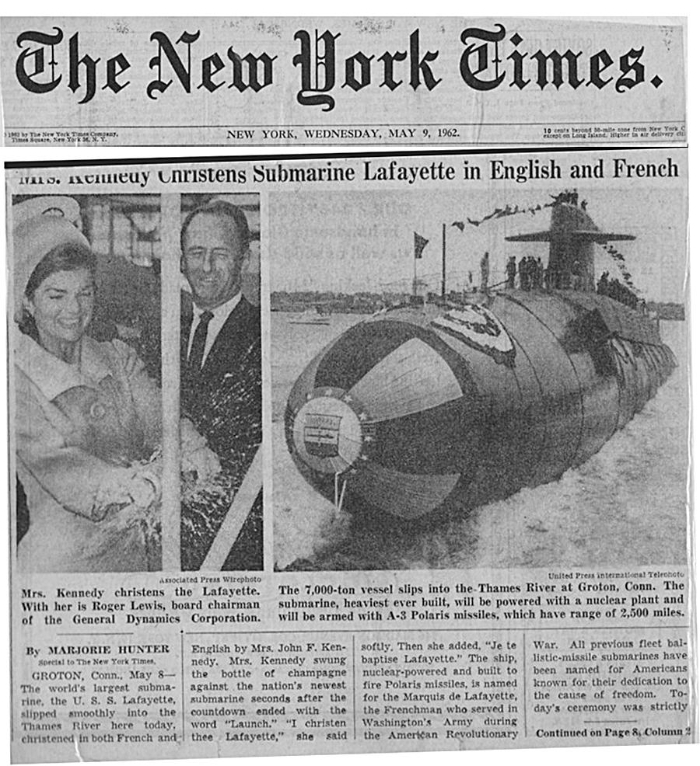 We got a patent on Christening bottles in the 60s, and achieved a tremendous level of publicity: First Lady Jackie Kennedy was pictured in the New York Times using one of our Christening bottles to launch a submarine in 1962. We expanded into the confetti business in the 90s, and are now the largest American-based manufacturer of confetti. 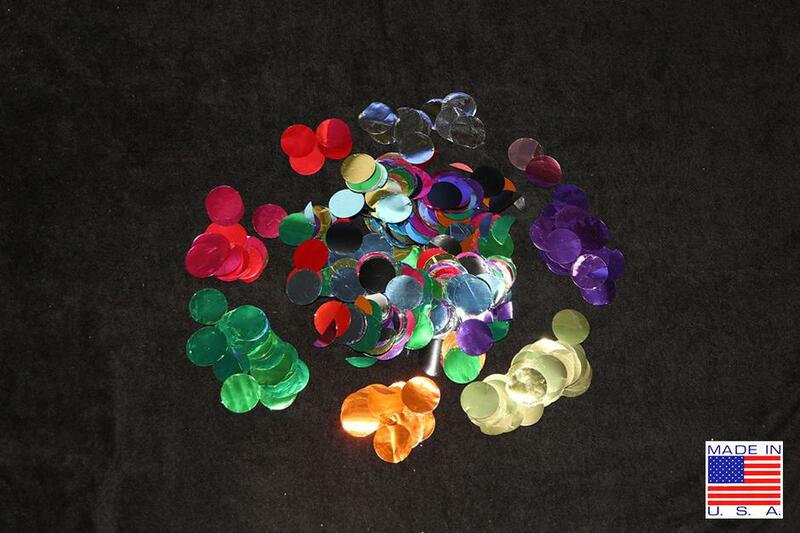 Our circular confetti comes in many colors, and is available in paper or mylar. 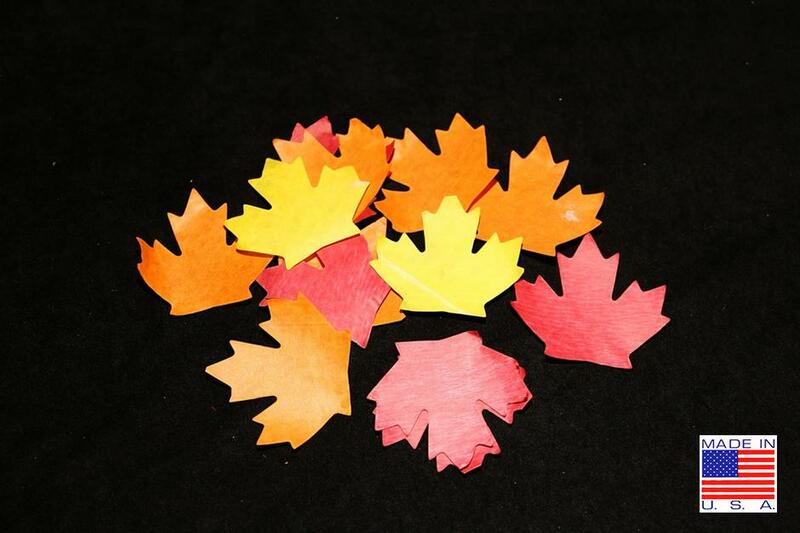 We sold 8,000 pounds of this leaf confetti for use in the Olympic Games held in Vancouver! 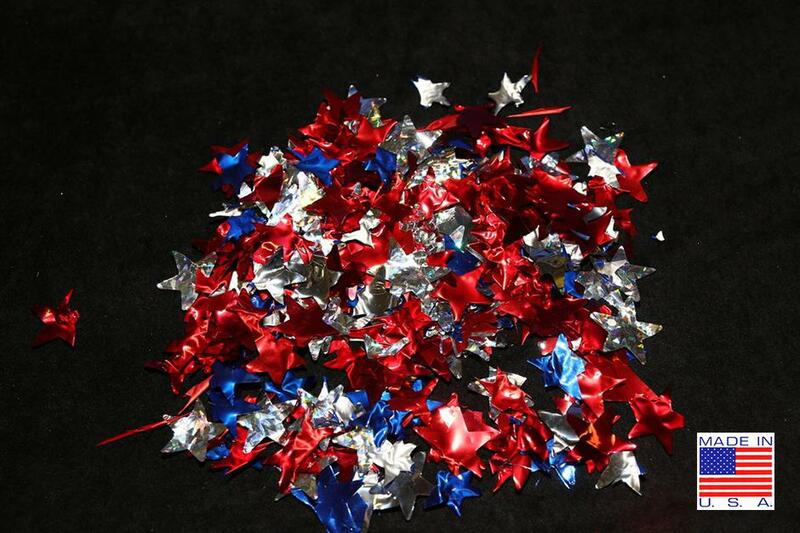 Star-shaped confetti is available in all colors, in both flame-retardant and non-flame retardant types. This collection of red, white and blue stars is the perfect way to enhance a Fourth of July celebration! Our snow confetti can be used to create a Winter Wonderland anywhere. 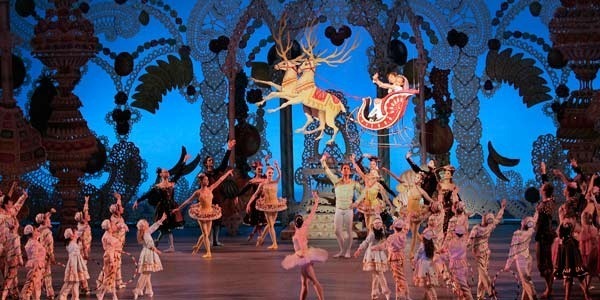 It is most popularly used in the Nutcracker ballet, which is performed all across the country in December. Shown above the small standard cut. It comes in all colors, in fire-retardant and non-fire retardant types. 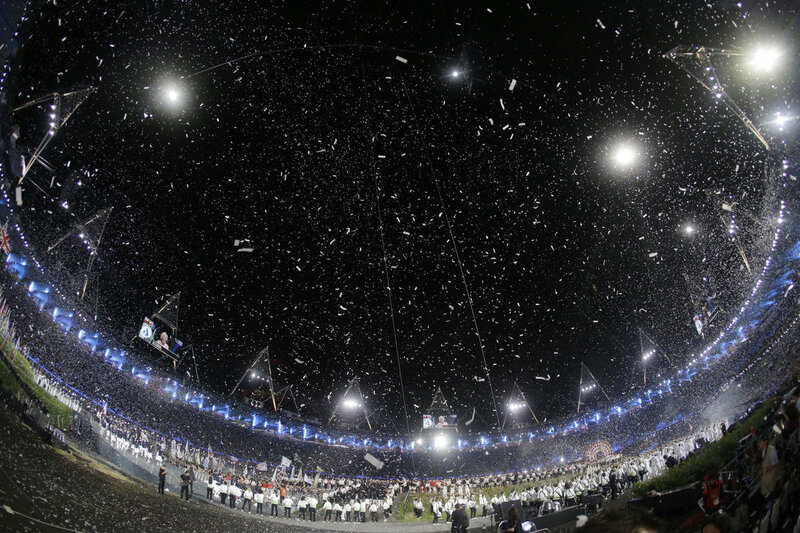 Our pure white confetti simulates snow for any event, indoors or outdoors. It is widely used every year in Nutcracker ballet performances. 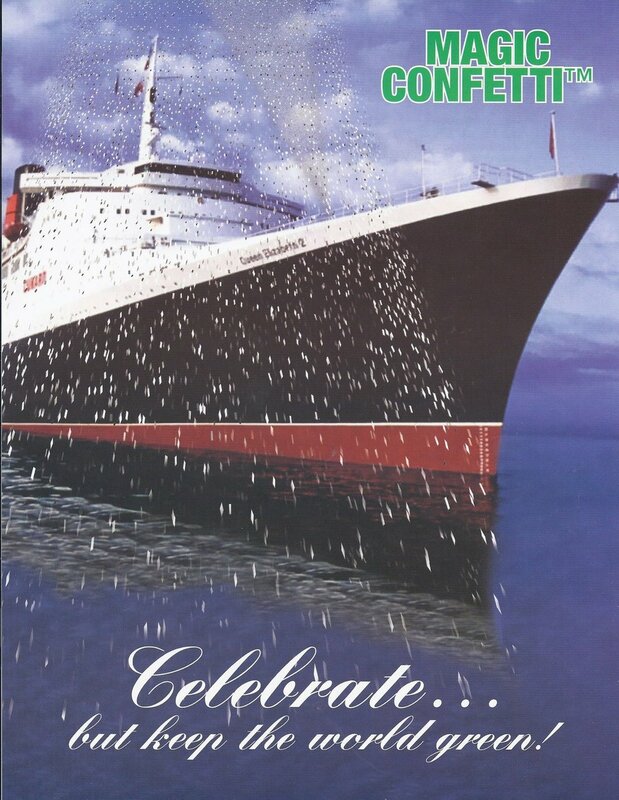 The Green Magic™ confetti is especially popular on cruise ships. With Green Magic™ confetti you don't have to worry about polluting the water. Any cruise ship can use this with the knowledge that Green Magic™ will simply dissolve in the water, with no harm to marine life or the environment! The photo of the sports stadium shows how easy it is to get rid of Green Magic™ confetti - just apply water from a pressure cleaner and it dissolves! No more messy clean-up operations that cost time and money. Photo by Carline Jean, staff photographer of the Ft. Lauderdale Sun Sentinel. The National Oceanic and Atmospheric Administration directed Shore Manufacturing to send Green Magic™ to an independent laboratory for product testing. It proves that the Magic Confetti does not impact the environment relating to fresh water, salt water, fish or animals. The Laboratory study was completed on August 11, 2007, and is on file with Shore Manufacturing. A copy of the 19-page study is available by contacting us. Our confetti used in the Colour Run in Fort Lauderdale, Florida a few months ago.